There’s something magical about big racing two-strokes. And somewhere near the top of that smokin’ hot tree is the Suzuki-SAIAD GT750 S Vallelunga. 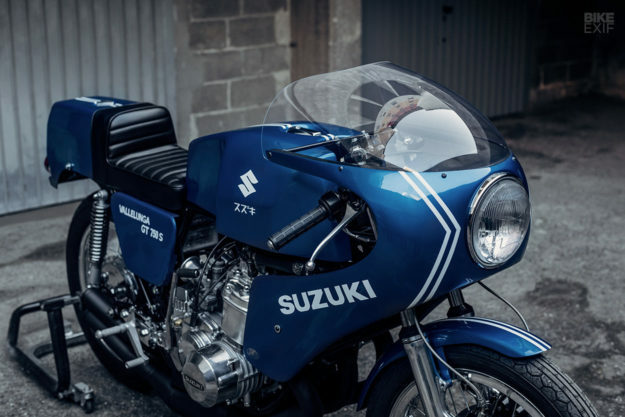 The story of the Italian-built Suzuki is a curious tale, and it’s rare to see one of these attractive racers pop up on the internet radar. 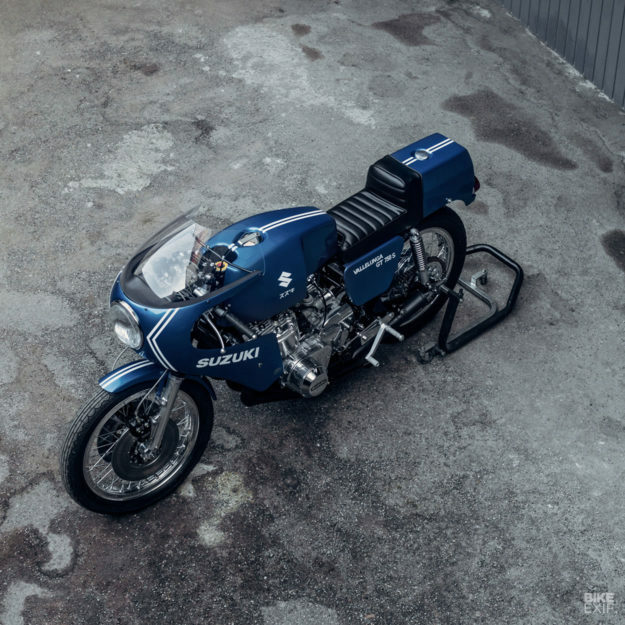 But the Piedmontese workshop Soiatti Moto Classiche has just found and restored one, and pushed the big zook back into the limelight. Soiatti Moto Classiche opened its doors in 1978, when SWM factory motocross racer Daniele Soiatti retired from official duties. Today Daniele and his son Alberto (below) restore motorcycles from the 1970s, which often arrive in their Novara workshop in very bad condition. 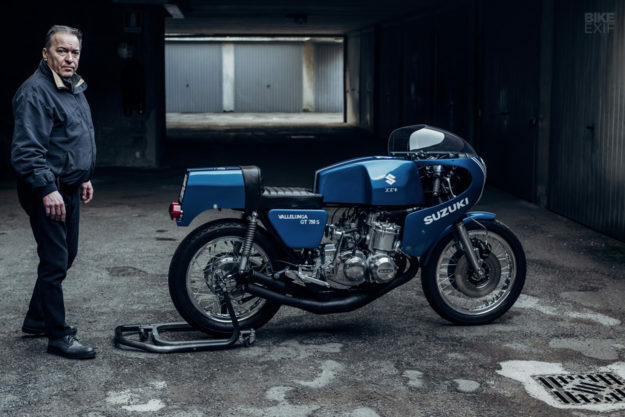 The Soiattis usually work on Japanese superbikes, but they occasionally open their arms to encompass lesser-known European marques—such as Hercules, Zündapp and SWM. It’s quality work too, and often showcased at top European concours events—such as the Concorso d’Eleganza at the Villa d’Este. 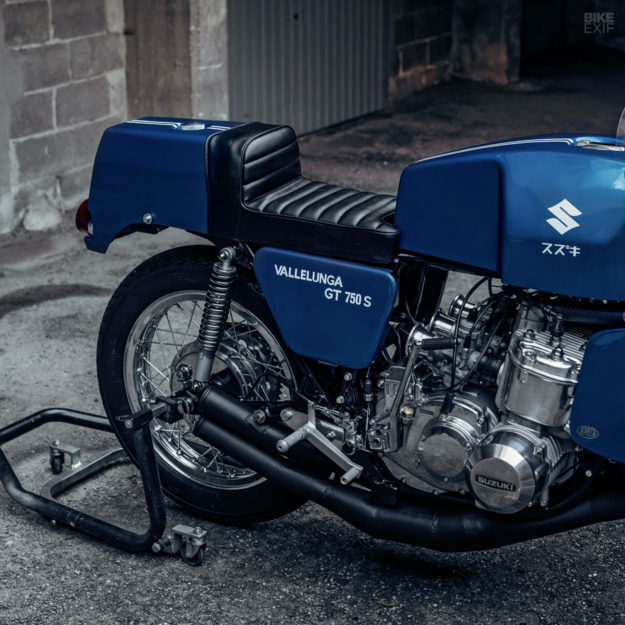 Not every bike is worthy of the lavish care that the Soiattis habitually deliver, but the Suzuki-SAIAD GT750 S Vallelunga is a very special machine. 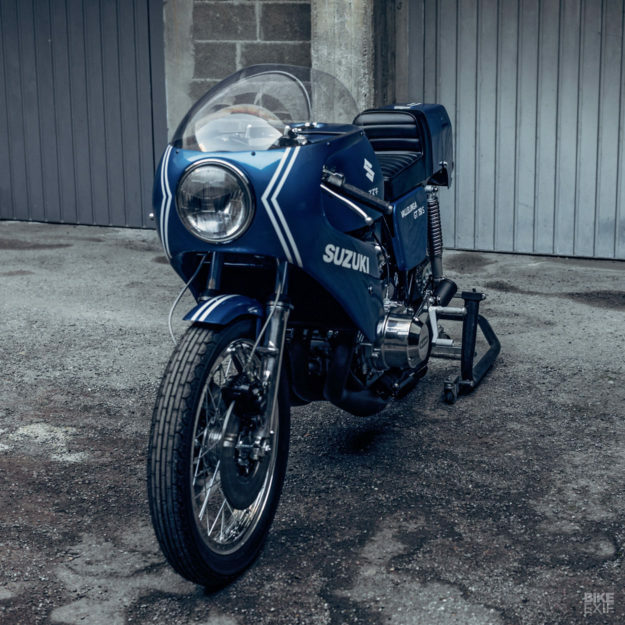 It’s one of around a hundred built by the Turin-based Suzuki dealer SAIAD in the mid 70s, and sold to privateer racers. 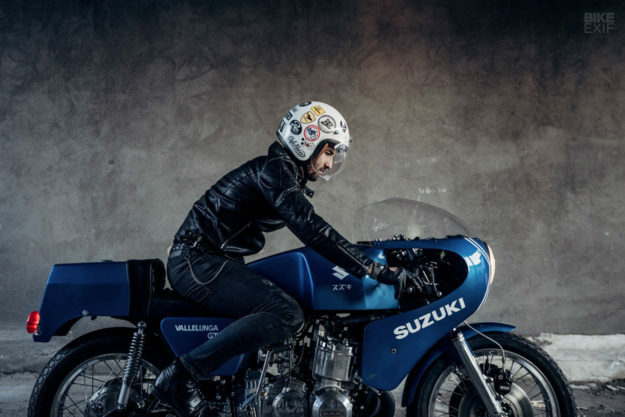 Compared to a stock GT750 two-stroke, light engine work freed up an extra ten horses. The weight drop was much more drastic: down from 245 kilos (540 pounds) to 190 (418 pounds). Top speed was reportedly 225 kph (140 mph) and Suzuki was so impressed by the Vallelunga, it adopted the bike as an ‘official’ model. The Vallelunga appeared in Italian advertising material, presumably to create a halo effect for the stock GT750. 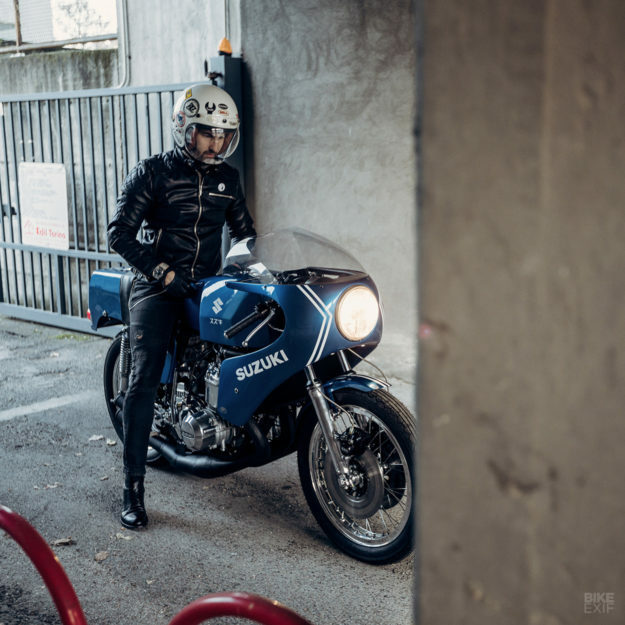 The machine restored by Soiatti Moto Classiche dates from 1974, is #35 in the production run, and was a mess when Daniele and Alberto first got their hands on it. 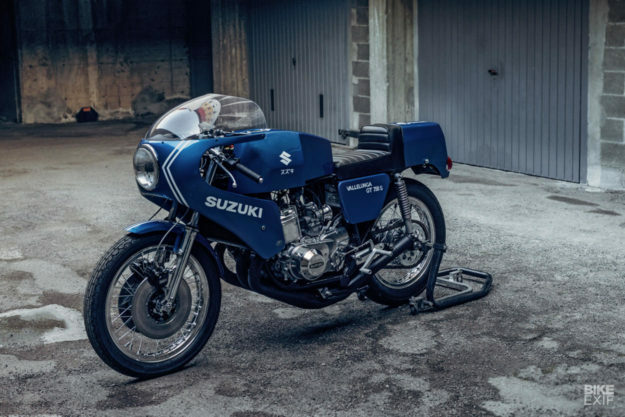 They’ve seen much worse, such as bikes recovered from the sea, but the Suzuki had been sitting in a garage for twenty years. 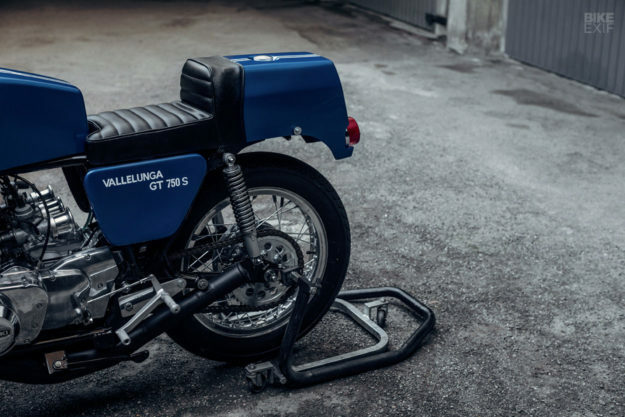 The first thing Daniele noticed was that the wrong type of water-cooled triple was sitting in the frame; it had been taken from a later version of the GT750. But luckily the owner also had the original Vallelunga engine to hand, so the Soiattis stripped that one down and started the rebuild. The crankshaft was rebalanced, and all the seals and bearings replaced. The engine cases were then sandblasted, and then coated with a petrol- and heat-resistant clear coat. The Figaroli mufflers were in very bad shape, with multiple scars and crushed in places. So they’ve been dismantled, pushed back into shape, welded, polished and repainted. Fortunately the frame was in reasonable condition, aside from surface rust. So it was sanded back to bare metal and repainted in black. The fiberglass bodywork was extremely tired, as you’d expect on a bike almost half a century old. 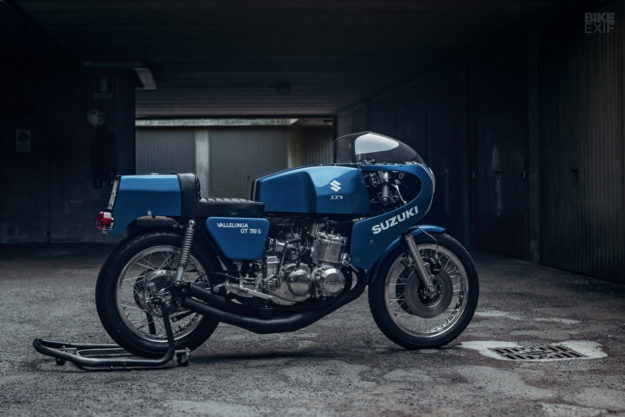 But rather than ditch and recreate Menani’s work, the Soiattis have meticulously restored it, and given it a fresh coat of authentic Suzuki blue race paint. They’ve also recreated the decals to exactly replicate the peeling originals. The saddle was beyond repair though, so there’s a new seat pad upholstered in black leather in the same style as the original. The rest of the machine has simply been fettled, refinished and returned to factory tolerances and specs. It’s all showroom fresh, from the Koni shocks to the aluminum Borrani wheels to the sandblasted, repainted brake calipers.